This is the fifth installment of our annual off-season series aimed at helping keeper league (KL) and dynasty owners address needs over the next 3-5 years. Each week we will examine a position, and note players and prospects who 1) are likely available in your league; and 2) we think have a good shot at earning double-digit R$ sometime between 2018 and 2020. Stable, established contributors are more difficult than ever to acquire, be it by trade or off your league's free agent list. This is even more valid for rebuilders with little excess talent to barter, and particularly relevant with respect to position players in deeper leagues. Similar to acquiring a top catcher, landing one of the better shortstop options gives you a significant competitive chip. Led by elite names like Lindor, Correa and Seager, there is a high bar for production at this position. Along with growth-moders like Orlando Arcia, Jose Peraza, Jorge Polanco and Tim Anderson, there are also out-of-nowhere wonders like Paul DeJong, Chris Taylor, Tim Beckham. Simply put, there are plenty of $10+ plus 27-and-under SS are readily available, with more likely coming in the minor league pipeline. And while most of the elite impact talent on our 2018 list may be 2-3 seasons away from delivering on that value, several names here could help in 2018, particularly in the scare SB category. ​However, note the position versatility factor here. Gleyber Torres is one of the very best SS prospects in baseball, but he's already been covered in this series as a 3B, since barring injury, he's likely to make his 2018 MLB debut either there or 2B. Lesser talents with SS potential (e.g., Christian Arroyo, Ryan Mountcastle, Mauricio Dubon) have been similarly examined under other positions. Last year in this column, Willie Adames' (SS, TAM) bb% and power gains in a Double-A jump were impressive enough to earn an above-the-cut spot, and we gave him an outside shot at a 2017 MLB debut. But while Adames held his own last year as a 21-year-old at AAA-Durham (.277/.360/.415 in 506 AB), another skills leap wasn't in the cards. Though his mid-70s ct% remains a work in progress, he'll almost assuredly break in at some point in 2018 as a good defender with at least average offensive tools (patience and bat speed among them) and plenty of projection. It might take a while for Adames to hit his MLB stride, but playing time in TAM should begin generating modest value sometime over the next couple of years. J.P. Crawford (SS, PHI) struggled through another season of BA mediocrity (.243 BA over 474 AB) in his second Triple-A go-around. The terrific patience (14% bb%) remains a constant, but the strikeouts are beginning to rise, as Crawford's ct% slipped just below 80% for the first time in his career. In addition, there's no sign of a running game improvement. On the plus side, Crawford lofted a career-best 15 HR, and rebounded from a .211 BA at the All-Star break to post a .287/.385/.513 in his final 195 AB. The turnaround earned a September MLB debut that produced familiar small-sample results (15-for-70, 16/22 BB/K) without any HR. With Freddy Galvis gone, the PHI SS job looks like Crawford's to lose, mitigating the short-term risk of being returned to Triple-A. Plus defense, plate control and overall athleticism could buy him on-the-job-improvement time, and Citizens Bank Park is a decent place to grow gap power. But aside perhaps from OBP value, Crawford looks like a 2018 project. Trea Turner's broken wrist created July opportunity for Wilmer Difo (SS, WAS), who then turned it into everyday playing time in August. Difo wound up hitting .303 over 238 2H AB, courtesy of a 38% h% that isn't likely to encore, particularly with sub-par power. That said, Difo's elite wheels—166/162 RSpd / Spd with 10 SB—are legit, as is his defense. While Turner's presence leaves Difo fighting for AB in a utility role, he has regular SS upside. Marginal above-the-cut selection, but he could be just a trade (or another injury) and SBO spike away a 30+ SB season or two. Splitting most of his time between SS and CF—and between two organizations—recently acquired Jorge Mateo (SS/OF, OAK) showed off plus-plus speed and a terrific running game once again, posting 52/13 SB/CS Between High-A and Double-A. The .267/.322/.459 line between A+/AA over 532 AB doesn't jump out, and a 40/144 K/BB points to his issues. But Mateo owns good bat speed, and career highs in Slg, HR (12) and xBH (60) provide some optimism. He may be another year from his first MLB AB, his defense needs work, and positional questions remain. But Mateo is a decent bet to run his way into $10 whenever the rest of his game just marginally ready. Having seen parts of two MLB seasons before his 22nd birthday, Raul Mondesi (SS/2B, KC) has clearly been rushed faster than anyone on our list. He again struggled with contact in his limited KC time (9-for-53, 22 Ks) But he perked up at AAA-Omaha, where he posted a 73% ct% (.305 BA) in 321 AB , along with a career-high 13 HR that hints at power observers have long predicted. If Mondesi can ever stop swinging at everything (6% career bb%, 5% in 2017), his natural tools should take over. Front and center is a plus-plus running game (21/3 SB/CS at Triple-A, 5/2 at KC) that will flourish if Mondesi can keep his BA above water. With Alcides Escobar now a free agent and KC a rebuilder, Mondesi should get plenty of rope with which to take a step up. Brendan Rodgers (SS/2B, COL) owned High-A pitching (1.078 OPS in 222 AB) early, then scuffled with contact (76% ct%, .767 OPS over 150 AB) in his initial Double-A exposure before a quad strain shelved him for most of August. A combined 14/71 BB/K tempers the immediate outlook, suggesting that Rodgers will need to refine his aggressive approach somewhat before his MLB debut—which looks more like a possibility than a probability in 2018. Still, he ended 2017 with a .336 BA, and having just turned 21, time is on his side. Rodgers is a consensus Top 50 prospect with plenty of BA and power upside, with a projected Coors Field destination in his future. Arm strength may be Rodgers' lone potential defensive plus, suggesting that he'll move off shortstop. But the bat should play anywhere. Amed Rosario (SS, NYM) lived up to his ceiling as an all-fields, hard-contact prospect in his first Triple-A exposure, batting .328 (83% ct%) before moving to NYM in August. He scuffled to a 70% ct% and 2% bb% at the next level in 165 AB, but a .248 BA was hardly a disaster—and the 4 HR / 7 SB flashed Rosario's moderate power-and-running game upside. 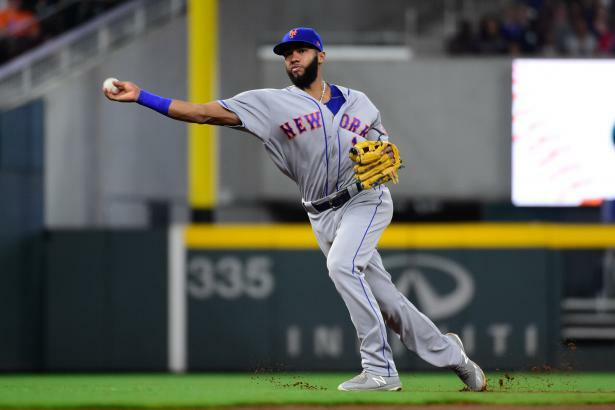 Still in growth-mode at age 22, Rosario's 2018 progress may be uncertain, but his athleticism and defensive skills should keep him in the lineup on a rebuilder while AB fuel help his value. We like his floor now and even more longer term. Plantar fasciitis held Addison Russell (SS, CHC) to 352 AB; certainly it and off-field issues impacted his 12 HR / .239 BA disappointment. But despite earning a 21-HR-fueled $12 in 2016, Russell's skills look stagnant going into his fourth MLB season. Last year's 109 HctX offers mild optimism for a 24-year-old who has yet to bat higher than .250—and who now needs to get it together entering a pivotal season. If you still like the athleticism, the growth-age upside, and the potential counting stats in a loaded CHC lineup, it's a buying opportunity. But Russell's ceiling is now a question mark. An early April wrist injury shelved Marcus Semien (SS, OAK) for three months and crushed his overall R$, but he rebounded nicely afterward (10 HR, .257 BA in 307 AB), all things considered. That 27-HR year from 2016 was already a bit of an outlier—but now following a partial season on a rebuilder, Semien may be overlooked and undervalued. The most interesting part of his 2017 performance was the 12/1 SB/CS, now 22/5 over the last two seasons. Longer term, suspect defense keeps Semien risky at SS. But presently as the Baseball Forecaster notes, a 20/20 sleeper. Last year's coverboy at SS and a pre-season ROY favorite, Dansby Swanson ATC (SS, ATL) is above the cut again only due to pedigree, age and the extended opportunity he projects to get with rebuilding ATL. Following a .232/.312/.324 (488 AB) disaster, Swanson should be readily available in most leagues; among his 2017 pluses are an 11% bb% and 128 Spd. But his power (6 HR, none in the 2H) was almost non-existent and Swanson's BA—two months over .300, two months under .160—was even more volatile. A buying opportunity for believers and bargain-hunting / rebuilding fantasy owners who can stomach the immediate growing pains. Bo Bichette (SS/2B, TOR): 19-year-old has yet to taste Double-A, but bat-to-ball skills (.362/.423/.565 in 448 AB at A/A+), above-average power potential and bloodlines already make him a consensus Top 40 prospect. May not stick at SS. Aledmys Diaz (SS, TOR): 2016 STL rookie surprise flopped last year, now in TOR, where the Troy Tulowitzki descent is picking up steam. HctX and bb% nosedived last year, but he still owns 109 HctX, 9% bb% and .879 OPS (404 AB) from 2016. Just don't look for a full rebound. Nick Gordon (SS/2B, MIN): 74% ct% was a disappointment in 21-year-old's 519 AB Double-A debut. But 9% bb% was an improvement and .270 BA held its own, with help from mild power uptick. Projects as defense-oriented, 15 HR / 15 SB middle infielder with BA skills, but this could take a while. Royce Lewis (SS, MIN): 2017 HS 1st-rounder began professional career in Rookie League and A-ball, but is already showing plus plate skills (25/33 BB/K) and top-shelf base-running (18/3 SB/CS) over 204 AB. Across-the-board upside, could move quickly. The current MIN SS favorite over the long haul. Ketel Marte (SS, ARI): Injuries gave 24-year-old regular 2H AB, made impressive bb%, ct% gains (11%, 83%) while upping HctX from 71% to 95%. Meh 29% h% wasn't helpful (.260 BA), nor was a 6% SBO to someone with his plus wheels. Needs starting job, green light to advance above the cut. Yairo Munoz (SS, STL): Part of return from OAK for Stephen Piscotty, he is now playing all over the infield and OF to enhance versatility. 22-year-old posted .300 BA, 82% ct%, 13 HR, 22/5 SB/CS over 446 AB between AA/AAA. Good arm, speed, hard contact; intriguing utility candidate needs better pitch selection. Kevin Newman (SS/2B, PIT): Both plus plate skills and sub-par pop deteriorated at higher levels following 2016 injuries (including concussion). Former first-round pick posted .814 OPS at A/A+ in 2016; .675 OPS between AA/AAA last year. Has an MLB future, but it's not looking quite as bright. Jurickson Profar (2B/SS/OF): Ex-consensus #1 prospect has regained plate skills, hints of Triple-A pop following injuries and disappointing comeback efforts. Seemingly out of favor in TEX, either needs change of scenery or most-of-the-time utility role to reach whatever might be left of his potential. ​Fernando Tatis Jr. (SS, SD): 19-year-old prodigy is here courtesy of our AB filter, might land in SD before 2018 is over. Legit 5-tool talent and Top 10 prospect made big post-April across-the-board gains at A-Fort Wayne before leapfrogging to Double-A. As high a ceiling as anyone on this list. Richard Urena (SS, TOR): Aggressive approach and hard contact had landed him at the end of a few pre-season 2017 Top 100 lists. But both HR power and plate skills sagged (.645 OPS in 510 AB) at Double-A. Still a project as he turns 22, and the TOR job is opening up. ​Pat Valaika (SS, COL): Why we don't dismiss COL hitters, even low-ceiling part-timers. Coors-aided offense (9 HR, 945 OPS at home, 4 and .674 on the road) and versatility fueled $5 R$ over 182 AB in MLB rookie season. 71% ct%, 4% bb% suggests that it may be all he has. More utility than legit SS prospect.